Bon Scott had his version of hell, I have mine. So, why is New Jersey my hell? Mainly because it's the state where Hoboken is, and US 1 actually takes you to Hoboken. Plus, Hoboken is fun to say. To be honest, it's US 1 that was the deciding factor. The fact that you can take US 1 from Maine to the Florida Keys, and it passes right by Hoboken was a bonus. 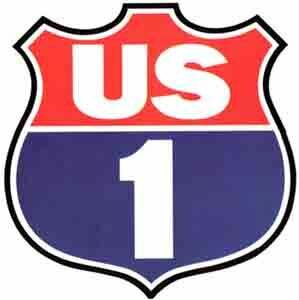 You see, todays post is about US 1. For those who don't recognize the sign, that's the road sign that signifies a US highway. That's what the US means. And the 1 means it's US highway 1. It's commonly shortened to US 1. What about a US highway makes it so odd that otter would write a post about it? Could it be that it's #1? Is it the fact that it stretches from Canada to the Keys? Is it the fact that it passes through Hoboken? While this post is about US 1, it's not about the highway. And that's what makes it qualified for an oddities post. So, what is this post about, then? Um.....haven't you been paying attention? It's about US 1! His name was Ulysses Solomon Archer. And he was a truck driver and vigilante in the late 1970's. He drove up and down the eastern seaboard in his pimped out Kenworth looking for the man who killed his brother, Jefferson Hercules Archer. What's so odd about that? It was the 70's. Death Wish was a popular movie, and it made vigilanteism seem glamorous. Well, the odd part was the person he was looking for. He was the driver of the big rig that smashed into the car Jefferson and Ulysses were in. Jefferson died, while Ulysses survived, with a metal plate in his head. And, it wasn't an accident. The driver of the rig called himself 'The Highwayman', and he travelled the road with the sole intent of causing death and destruction. The Highwayman freely admitted that he sold his soul to the devil, and that was why he did what he did. So far it sounds like the plot of a very bad movie, right? Well, it would be a very bad movie. But no, it's not the plot of a movie. Hang on. Weren't we talking about US 1? US 1 is what Ulysses called himself. After all, no self respecting super hero would ever use their real name. That's right. US 1 was a comic book super hero. And in every issue, he chased The Highwayman, trying to get justice for his dead brother. So, since every super hero has a super power, what was US 1's power? He had the ability to receive and transmit CB Radio signals with the metal plate in his head. Anyone anywhere could duplicate US 1's super power with a $100 CB Radio. And, in the 1970's, everyone had a CB Radio. My parents each had one in their cars. Because it was the 70's. It is my opinion that US 1 is just about the oddest super hero ever. Unless you consider The Dogwelder. He was a mysterious one. You never saw his face. He always wore a welding mask. And what was his super power? Tackling bad guys and welding dead dogs to their faces. Anyway, US 1 and the Dogwelder are just two of the odder super heros out there. I could tell you about more, but I don't feel like typing a novel. There's that many of them. It makes you think that super hero creators have run out of ideas. OK....one more. His name is Arm Fall Off Boy. Which is really a misnomer. His arms don't fall off. He has to pull them off. Then he uses them to beat criminals senseless. With his arms. That he pulled off his torso. Look, he even has a wiki page.